In Webuye East sub-county, Bungoma County, 30-year-old Teresa Nekesa ushers us into her house with a smile, her two young children in tow. Her other two children are studying at a nearby school. She informs us that the youngest just turned a year old. We are impressed. He is noticeably a healthy boy. Teresa is one of 8,400 child caregivers who has participated in a thematically structured community-based nutrition education, facilitated by trained Community Health Volunteers (CHVs). This is an ongoing initiative by the Feed the Future Kenya Accelerated Value Chain Development Program (AVCD), funded by USAID and implemented by the International Potato Center (CIP) and partners. It was while expecting her fourth child in 2016 that Teresa met Caroline Wepokhulu at a nearby health facility—Namarambi dispensary—during an antenatal visit. 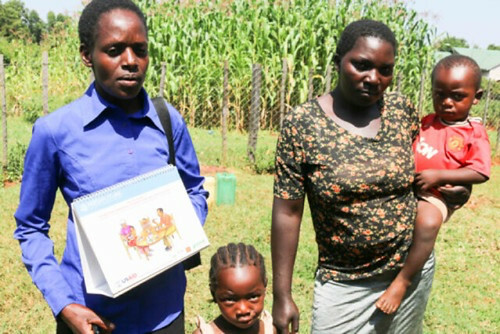 Caroline Wepokhulu, a trained CHV together with the facility nurse sought to understand her nutrition practices and subsequently enrolled her for follow-up teachings together with 11 other women who were either expectant or nursing children under five years. Malnutrition is a serious problem in Bungoma County with 30.5% of children under 5 years suffering from severe malnutrition (KNBS, 2014). Over five months, Teresa and the other women received nutrition education to improve both their knowledge and practice at the household level. The CHVs received training aids in the form of flip charts that they used during the child caregivers’ training sessions. “I was trained on how to plant OFSP from vines and also different ways of utilizing it effectively as part of a healthy diet. This is the information that I pass to the women every time I meet them. I tell them they now have locally available Vitamin A,” says an enthusiastic Caroline. She adds that the women in her group are mixing OFSP with foods such as rice and meat, and the results are healthier families. Teresa confirms that she often mixes OFSP with milk and feeds her young son and incorporates it in other foods. So passionate is Teresa about OFSP and their health benefits that she does not want other women missing out. She mostly grows her own food and sells the surplus to them. At one time, she prepared OFSP and had it delivered at Namarambi dispensary to prove to fellow women that it is a tasty root full of pro-vitamin A. At that time, there was a lot of negative perception about OFSP, owing to its relatively low dry matter content in comparison to local varieties. In this she succeeded, proving it was all about the manner of preparation. 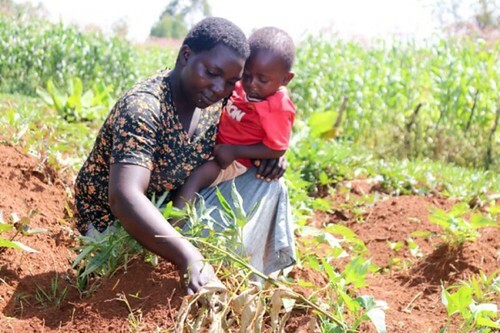 “When I received 200 OFSP cuttings from our CHV for the second time in May, I planted all on a section of my half acre piece of land together with other vegetables and maize,” says Teresa. She expects to harvest the OFSP Vita variety in just three and a half months and also preserve some vines for use in the next growing season. Teresa informs us she first came across OFSP while staying in Teso district, in close proximity to the border between Kenya and Uganda. Therefore, when she received 200 vines for the first time in 2016, she was excited and planted all the vines on a section of her farm expectant of a good harvest. The rest of the community was however not so enthusiastic. Most of them did not pick the vines. “In June 2016 when we distributed vines for the first time, the community was not receptive. Only 8,656 households collected the vines. Many viewed OFSP with skepticism,” notes Anthony Siangu, a Community Health Extension Worker. Following training in the months that followed and cooking demonstrations, demand for the vines increased. Open minded women such as Teresa and CHVs played a huge role in convincing neighbors through demonstrations. “During the second distribution in May 2017, 13,369 households received the vines and there was demand for more,” continues Anthony. At the Namarambi dispensary, for instance, only 90 households collected the vines over a three-day period in 2016. In 2017, at least 225 households collected the vines within five hours. There was demand for more. For the second half of the program, CIP and partners will continue working towards improved nutrition knowledge and practice at household level with an aim to reach the set target of 65,000 women and 54,000 children under five by the end of the project.